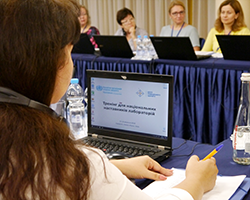 In support of Ukraine’s ongoing health-care reform, specifically the reorganization of its public health surveillance system, WHO led a 4-day workshop for national laboratory mentors in Kyiv on 11–14 September 2018. The aim of the workshop was to strengthen mentors’ capacity and expertise in implementing a quality management system (QMS) in alignment with international standards. Following the workshop, the mentors will in turn support laboratories in implementing principles of quality and safety. Among these laboratories are 3 located in the regions affected by the armed conflict in eastern Ukraine. A key method for the effective and efficient strengthening of medical laboratories is the implementation of a QMS based on the international quality standard ISO 15189:2012. In 2014, WHO launched a web-based tool that guides laboratories through the practical day-to-day implementation of the QMS: the Laboratory Quality Stepwise Implementation tool. Several laboratory managers and quality officers in Ukraine have been involved and trained in the implementation of a QMS through the Better Labs for Better Health initiative. Yet there is still a need for external assistance in the implementation process. Regular mentoring is therefore crucial to achieve QMS implementation. At the end of the workshop, further steps to strengthen the public health laboratory network were planned and agreed with national stakeholders. The Ukrainian Public Health Center is fully committed to supporting these important activities in future. Better Labs for Better Health is an intersectoral approach that seeks to provide sustainable improvements to the quality of all laboratories that deal with health. Since 2017, WHO has provided assistance with the implementation of the Better Labs for Better Health initiative, and the improvement of infectious-disease surveillance in Ukraine through mentoring and capacity-building of laboratory management at national and subnational levels.